Alice Vogler, Cortar Rope, Performance #3, Time on View, Proof Gallery, Boston, MA, October 10, 2012 (photo by Vela Phelan). 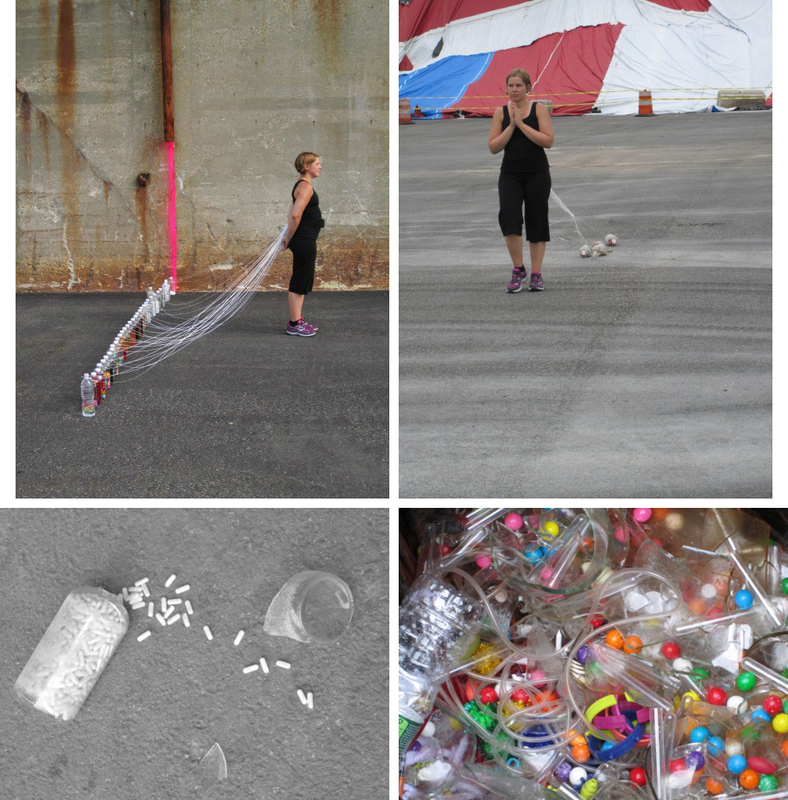 Alice Vogler is a Boston-based artist and curator who works primarily in performance and sculpture. Travelling nationally and internationally, she has performed and exhibited her work at locations including Defibrillator Performance Art Gallery in Chicago, IL, Grace Exhibition Space in Brooklyn, NY, Mobius in Boston, MA, the OPEN Art International Performance Festival in Beijing, China, and the Primer Festival Internacional de Performance SLP in San Luis Potosi, Mexico, among many others. 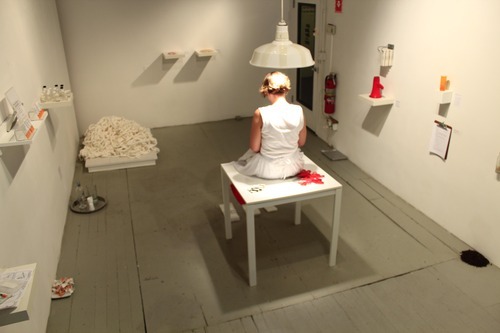 In addition to her art practice, Vogler has been an actively involved in Boston’s performance art community as a co-curator and founder of MEME Gallery (2009-11), a member of the Mobius Artist Group (2006-08), and a co-producer of TEST performance art events (2005-08). We visited with Alice at her home to talk about her work as an artist and curator. 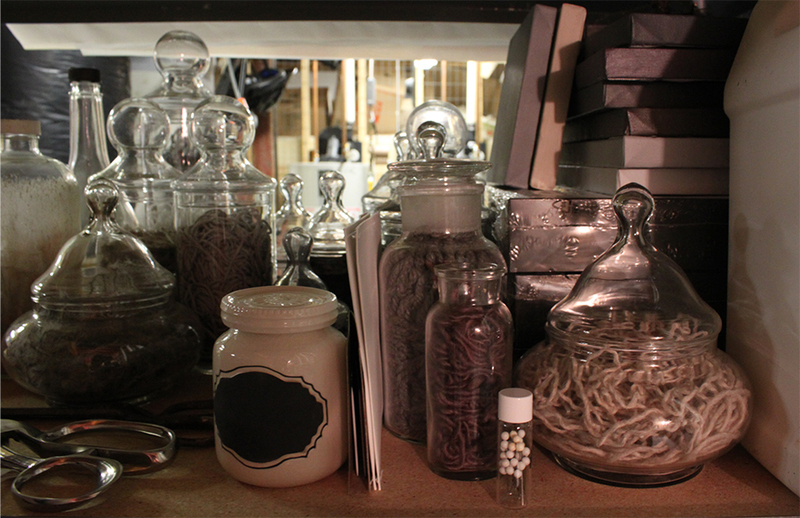 Although much of her work is performance-based, Alice keeps a studio in her basement where we were able to see relics, documentation, and other bits and pieces from her past performances. 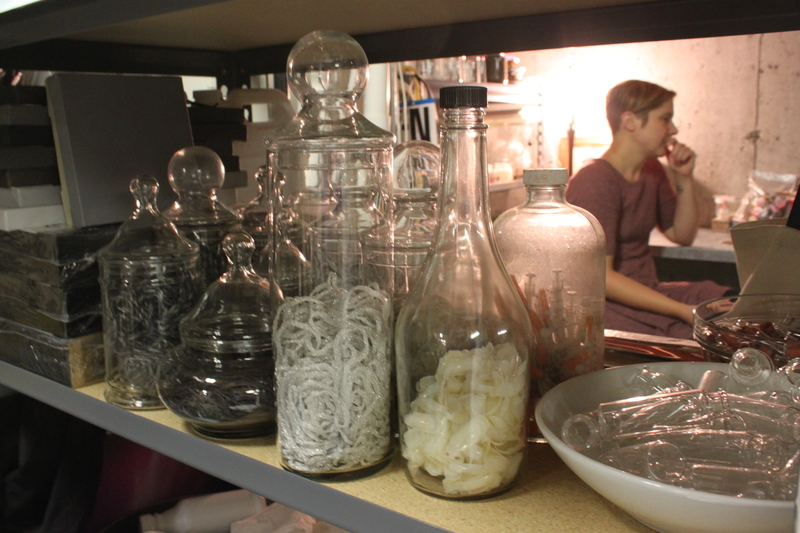 Filled with collections of different objects in jars and vessels, the space felt part natural history museum, part pharmacist’s apothecary. Alice’s focused attention on the objects and actions that make up her work provided a thread that ran through much of our conversation. The following interview culminated our visit. Andrea Evans: Hi Alice! Thanks so much for having us by to talk about your work. You studied at the Pacific Northwest College of Art in Portland, Oregon, and then went on to grad school at the School of the Museum of Fine Arts, Boston and Tufts University. In our discussion in your studio, you mentioned that you started out as a sculptor. This background seems pretty evident in your performance works, which demonstrate an incredible attention to the objects you use. How did you make your way from making objects to focusing more on performance-based works? 1. 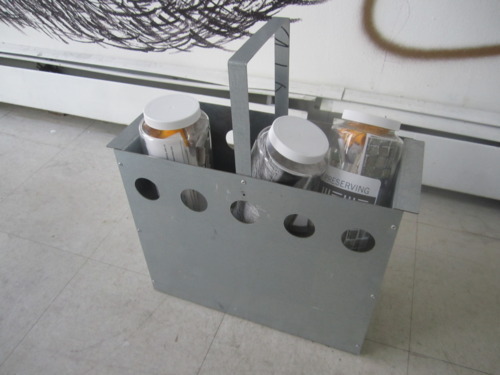 I started making time-based sculptures that would disintegrate or fall apart over a certain period of time. 2. I felt overwhelmed by the pure quantity of stuff that exists in the world and I consciously wanting to stop contributing. 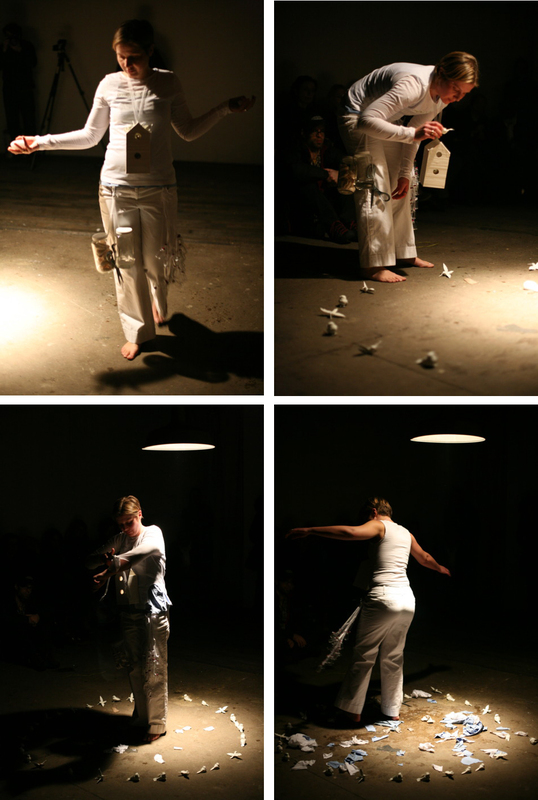 Alice Vogler, Continuously, Grace Brooklyn, LUMEN FESTIVAL! !, Atlantic Salts, Staten Island, NY, June 2010 (photos by Vela Phelan). AE: You have been incredibly prolific in your practice, making a wide range of performance works. There seem to be some major themes that run through your work, such as a focus on mental and physical healing processes, ideas of containment and preservation, slow and methodical actions…what other threads do you identify in your work? Where do these interests originate, and how have they evolved in your work? AV: Geez those are some pretty big questions. Other threads? Humm….interaction / audience participation is a very important part of my work and something I consider in every piece I do. As for where these interests originate I would have to say they come from me, from my life experiences and they evolve as I evolve. Naturally. Alice Vogler, Rebuilt Involuntary Vision, Maximum Perception Festival, Brooklyn, NY, January 2011 (photos by Vela Phelan). AE: Can you walk us through your process of how you prepare for a performance? How clear of an idea do you have in advance? How much room do you leave for chance? Have you ever drastically changed the direction of a piece during the actual performance? AV: Well I am always writing down ideas, and observations. I start working on or planning for a piece a few weeks before a show. I usually have a pretty clear idea in my head of what I want or at least what the elements of a piece are…where I will be positioned in relationship to the audience, what my materials are, generally what my actions are going to be, what the role of the audience is…. Chance is for me what makes performance art, performance art. It’s the exciting part. The unknown. There is always some surprise, it might be small but it’s always an element. Drastically changed a piece during a performance? Yep I have. For hour 23, I was planning on eating two dozen roses, 24 hours, 24 roses. In preparing for this performance many of the actions came from images in my head….what they would be visually. I was thinking more visually due to the fact that I couldn’t talk to people in the same way I normally do in my performances – I speak only a little Spanish. I knew that roses were edible, I really liked the idea of slowly eating 24 of them over the hour…..BUT…..they were disgusting!!! I did NOT think about them being sprayed with pesticides….why this did not occur to me I don’t know. So when I starting eating them I realized that I was not going to be able to complete my planned action…I tried…you can see the banana peel in the image….I thought I would try to wash down the roses with a banana…didn’t really work. SO…..I actually left the room, which I hadn’t left at all until that point, and gave the rest of the roses away to the audience. I like giving things, it made sense…. 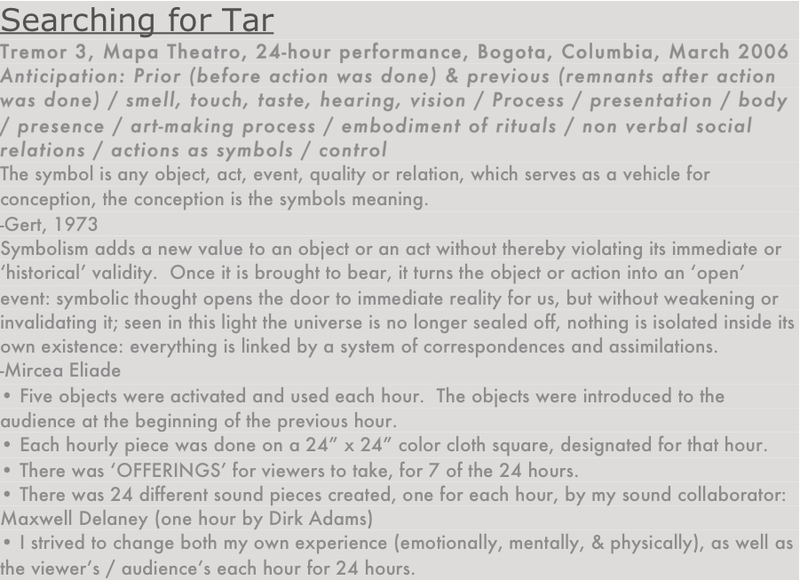 Alice Vogler, Searching for Tar, Tremor 3, Mapa Theatro, 24-hour performance, Bogota, Columbia, March 2006 (photo by Vela Phelan). AE: Speaking of the performance in Bogota, you have had many opportunities to travel to participate in different performance festivals. A few others include as Rapid Pulse in Chicago, Mind the Gap in Istanbul, and the OPEN Art International Performance Festival in Beijing. How much of a role does the location of a piece have on the work you choose to make there? How have you found your work to be received by this wide range of audiences? Have you found there to be a significant difference in your audiences in the United States vs. other countries? AV: First, I did not actually perform in Istanbul, I created an interactive (performative) sculpture. It was received well from what I heard and many people interacted with it. I do absolutely think about where I am going, who my audience is, but more important is the space / the location of where a piece will be happening. At Rapid Pulse and at OPEN I used the designated “gallery” space as well as outdoor spaces around both venues. 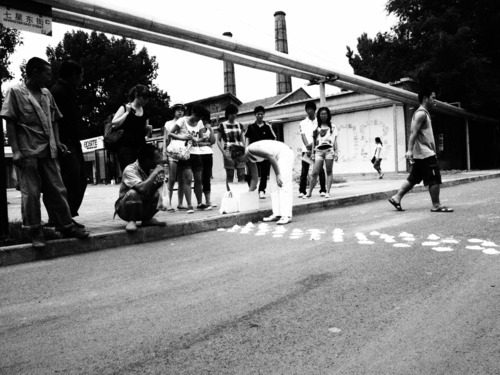 Alice Vogler, Open Expansion Control, OPEN Performance Art Festival, 5-hour performance, Beijing, China, August, 2009 (photo by Vela Phelan). Language usually plays a large role in my work, in different ways, but it is almost always present in some way, so when I travel to another country where I do not speak the language, that element of my work is removed, which changes how I approach the piece, and the audience. Often times I will have a sort of job for the audience…that is harder to do when I cannot speak to them! 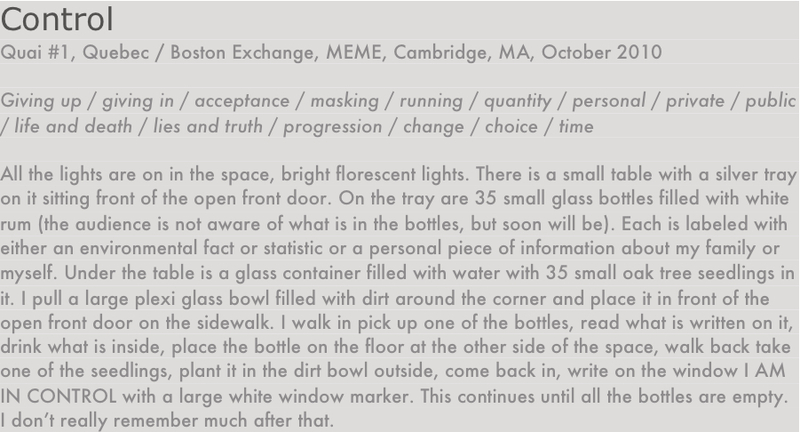 AE: In 2012, you had a show “Time on View” at Proof Gallery in Boston, in which you showed relics from past performances and living interactive sculptures. One of the things I noticed through this exhibition was your incredible attention to the objects you use in your work, and the way in which there seems to be a specific aesthetic sense that runs through many of your pieces. In that exhibition, there was a real emphasis on the white space of the gallery, the whiteness of many of the objects, with accents of saturated color, such as the red-handled scissors and the red trim of your dress in the “Cortar Rope, Performance #3” that took place as part of the exhibition. It seems that you intentionally craft very striking visual images in your work; does this come from your background in sculpture? You seem to be very specific in each choice you make in a piece, with each object, color, and gesture chosen to carry particular content. How do you choose the objects you work with, and how you want to engage with them? Alice Vogler, Cortar Rope, Performance #3, Time on View, Proof Gallery, Boston, MA, October 10, 2012 (photos by Vela Phelan). AV: Thank you. I am absolutely specific and intentional in every object I choose to use in every performance. An idea, the idea, drives my object choices, always. I figure what I want to say, what I want to get across in the piece and then I figure out the objects. This work really struck me as a viewer, as an audience member, as a witness to this action. During the performance, you became increasingly and visibly intoxicated. I kept wondering through the whole piece if you were ok, and if someone, if I, should step in at some point to stop the piece. As an audience member of a performance, I often feel very privileged to be a witness to this particular action or artwork that is happening right in this moment in front of me, and I know that as an witness, I am implicated in the work as well. I often want to trust the artist, to be there to help them see their vision through to the end. But there are times in viewing performances with a level of risk, when the question arises of whether the work should be stopped. If something happens to the artist, if we (the audience) allow something to happen, we aren’t without fault. We were there and we didn’t stop it. This leads me to a few questions for you in regards to your work: how do you view the involvement of the audience in your pieces, and how do you manage the aspect of risk in your performances? In a piece like this, do you think someone should have stepped in to stop it? I know you have had earlier pieces that have been stopped by an audience member or curator (such as “Confidence in Objects”, 2006, which involved you cutting yourself with razor blades. You also noted that no one offered you a band-aid in this performance, even though there was a bowl filled with them, accessible to the audience). How do you navigate this territory around risk as an artist, and as an audience member of others’ performances? 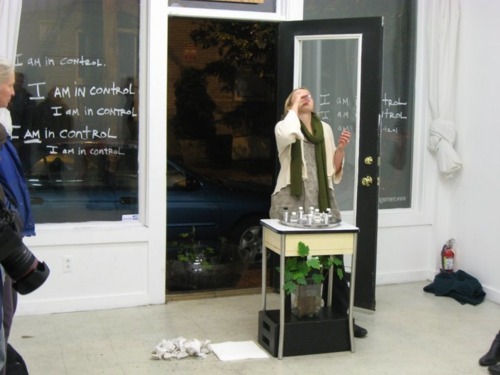 Alice Vogler, Control, Quai #1, Quebec / Boston exchange, MEME, Cambridge, MA, October 2010 (photo by Vela Phelan). AV: As I have mentioned the audience is, in most of my work, a critical part. What part that is varies piece to piece. They sometimes will have “jobs” as they did in BioSponse Test 1 or they might be asked to do something with me, like play dominos with sugar dominos in Wanna Play? Without the audience both of those pieces would’ve been completely different, unsuccessful in my mind. Any sort of risky action is tied to the idea behind the piece, the message, my message, my voice. I choose everything because the piece needs it in order for my idea to be communicated. Do I think someone should have stopped me during Control? They didn’t so I guess the answer to that is no. How do I navigate risk as an audience member? I am assuming you mean how do I deal with seeing actions that are dangerous to the performer/artist? I do feel that it is a conscious choice by the artist to put him or herself in whatever position they are in. That being said, I have stepped in and asked the artist if they are ok. I have stepped in and helped when I felt it was needed. I have never had an artist say they were not ok.
Alice Vogler, Nightful of Gifts, Grace Exhibition Space, Brooklyn, NY, Nov. 23, 2012 (photos by Vela Phelan). AE: Well, for example, do you ever do “tests” or practice beforehand for performances that have an element of physical risk in them? Or do you feel like you have a pretty good sense of what you can put your body through? AV: Nope, no tests. Part of performing for me is the surprises, the unknown….that’s the good stuff. If at any point I started doing something and I felt like I completed my prepared action, I would stop. AE: As Kirk and I have been developing our thinking around the focus of Temporary Land Bridge, we have felt it really important to include a wide range of artistic practices. For artists who work within the often ephemeral realm of performance art, the idea of a studio space or even a studio visit may hold a very different form. 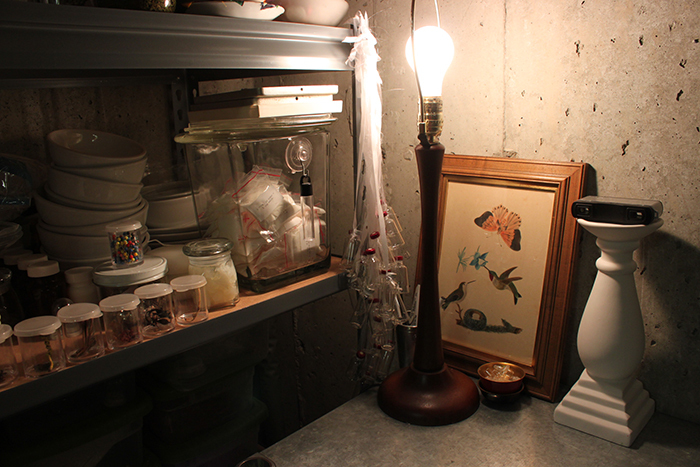 You have a space carved out in the basement of your home, where we met, that houses your objects, collections, and other materials. How does the idea of a studio function for you in your practice? Have you found it necessary or helpful to have some kind of designated, separate physical space within which to work, think, and research? AV: I pretty much only use that space when I have a show coming up that I am working on…I don’t sit down there and brainstorm ideas or pieces, ever. The writing, the ideas come from everywhere…from living and existing in my body. The space is more of my prepping area. That is its function. AE: In the time since you finished graduate school, you have not only built a strong national and international performance practice, but also have been involved in a number of organizations that have helped heighten the visibility of performance art in the Boston area. You were an artist member of Mobius (a Boston-based, non-profit, artist-run organization that focuses on performance and experimental art, founded by artist Marilyn Arsem in 1977), a co-curator and co-founder of MEME Gallery (a space developed for ephemeral art to be made and witnessed, that existed from 2009-2011 in Central Square in Cambridge, MA), and have performed in exhibitions, festivals, and exchanges in New York, Chicago, the Yucatán, and Istanbul, just to name a few. You also currently work as the Arts Program Manager at the Children’s Museum in Boston. How did you move in to these proactive roles, not only as an individual artist, but as someone who creates and develops opportunities, and a community, for other artists? Do you view this as part of your art practice or role as an artist, or something separate that informs your individual work? AV: Curating work came from wanting to see a certain realm of work that I was just not seeing here in Boston. It was a group effort, a group feeling…it wasn’t just me. I have been very lucky to have amazing people around me to work with…my husband, Vela Phelan, and my dear friends and colleagues Sandrine Schaefer, Philip Fryer and Dirk Adams. There is a lot of great work happening all over the place. My feeling was/is that it should be seen. Unfortunately MEME was not sustainable for any of us. Preserving MEME / the travellers box, MEMENDS CELEBRATION, MEME, Cambridge, MA, May 2011. As I said, I feel very lucky. I love what I do, I love my job, the people I work with, my Boston colleagues that continue to grow, change, and inspire others around them. AE: Thanks so much Alice for your time, and for giving us the opportunity to talk about your work in more detail. Along with Vela Phelan and Joseph Raven, Alice is curating the third rendition of “Time Body Space Objects” (TBSO3), to be held on March 8, 2014, at Defibrillator Performance Art Gallery in Chicago, IL. The event features 12 artists performing over 12 hours, one hour for each artist. 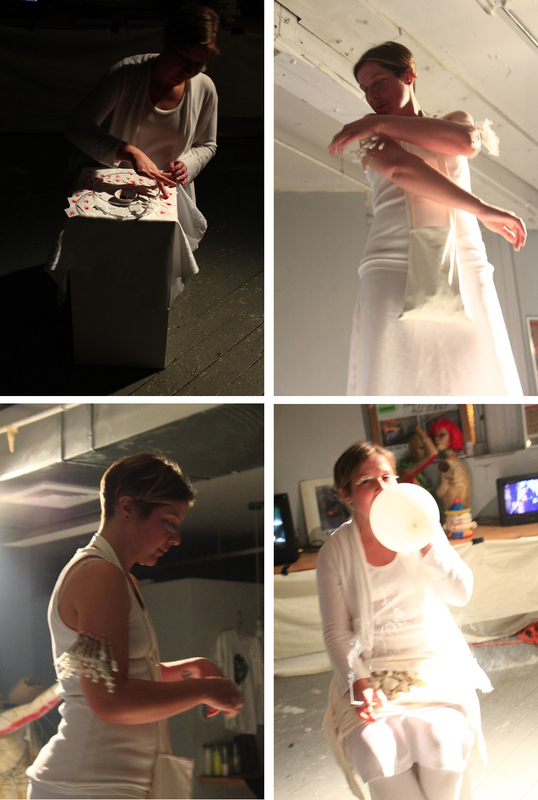 Tags: Alice Vogler, Performance Art, sculpture. Bookmark the permalink.